Nothing say the Holidays quite like Candy Canes, so why not combine Candy Canes with another holiday favorite -- Fudge. 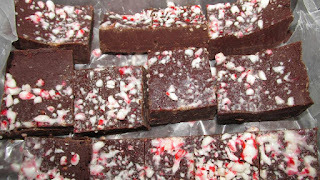 I love this Chocolate Peppermint Fudge aka Candy Cane Fudge. Fudge can be sent to far-flung friends and family, given as a gift, or enjoyed by the family during the holidays! Fudge is so versatile and easy to make. Line 9" pan with wax paper. Melt chocolate with sweetened condensed milk and salt in heavy saucepan over another saucepan with simmering water (or in top of double boiler). Stir until melted. Remove from heat; stir in peppermint extract, and half the crushed candy canes. Spread evenly in prepared pan. Top with the rest of candy cane crumbs. Remove from pan by lifting edges of wax paper.